At Top Buttons we have two main programs. The first program is our Boutique Program through which we serve ALL women in our community. We provide a beautiful environment with quality clothing items at low cost for anyone to purchase during public shopping hours. The items we offer would not normally be accessible to many who come shop with us. We strive to provide designer thrift items which are both clean and current for women to choose from for any occasion. It is not uncommon to have families of the girls enrolled in our Wearing Confidence Program come in and shop with us during public shopping hours. We love these opportunities as they enable us to pour into an entire family! We are often asked, “Who is your target market or the main demographic served through the retail side of Top Buttons?” When asked, we take great pride in saying, “As a nonprofit, our goal has never been to be a retail operation. However, we love that we are serving women of all economic backgrounds through our times of public shopping.” It is our hope that as a community, everyone has a way to both give to and receive from Top Buttons. 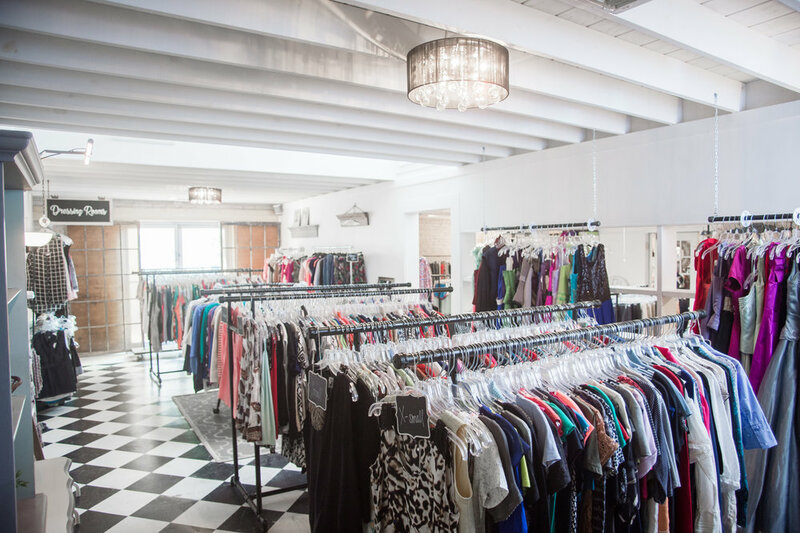 The mission comes full circle as women donate clothes, volunteer, and shop with us. 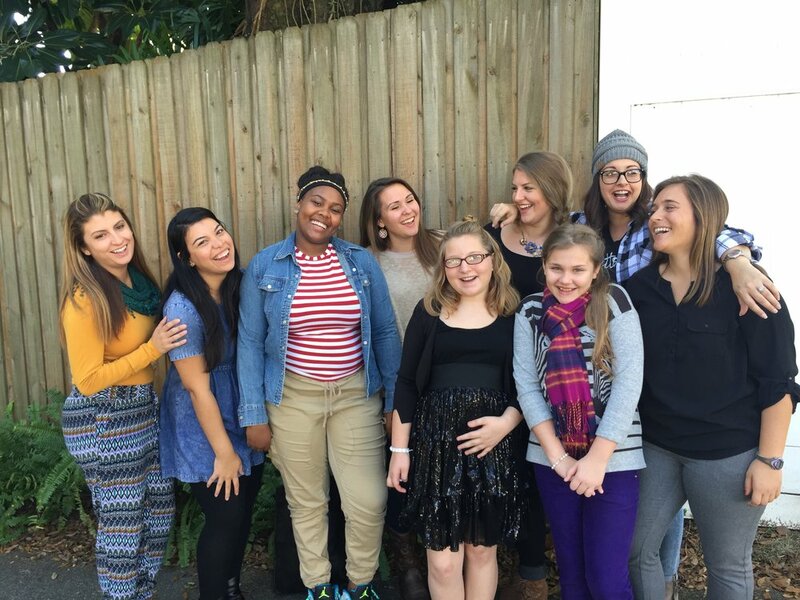 We love providing opportunities for all young women to volunteer. It teaches both job skills and helps many obtain community service hours through our Boutique Program and our Wearing Confidence Program. Our Wearing Confidence Program is also facilitated through our boutiques and has two components. We offer education on contextual modesty, how to dress on the job, self- compassion, and most importantly - understanding identity in Christ. Through our Wearing Confidence Program, in addition to the educational sessions, we offer boutique sessions. Large groups of girls from our enrolled organizations come to us for private styling sessions. The sessions include styling services, free wardrobes of proper fitting attire, hair and makeup up touchups, free makeup (if age appropriate), professional photoshoots, and a mini devotional or educational piece. 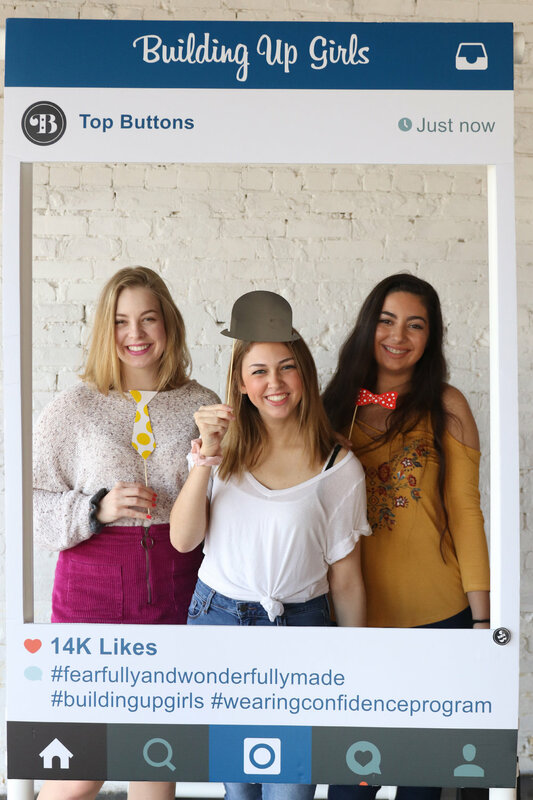 It's important for you to know that our stylists are not necessarily fashionistas, they are young women who want to give their time, love on, build up, and encourage girls in our community. Stylists are matched one on one with a program recipient where they shop our stores and talk about style preferences and clothing needs. Modesty really has so much to do with context even more than a specific set of rules. We look to prepare our girls with appropriate attire for school, the work place, and every day/casual options as well! It’s not about creating little GAP models. That’s why having nice thrift clothing is so helpful. We have an overwhelming amount of style options for our girls to mix, layer, and get out of their box with when it comes to their individual clothing vibe. It’s fun. 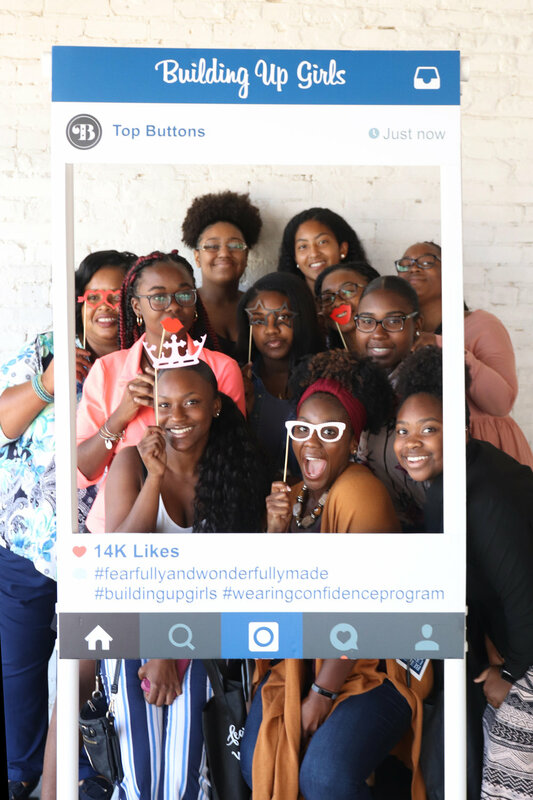 Being together with other young women talking fashion, life, and faith makes for a great combination to connect and grow together. If you want more information about volunteering with us email info@topbuttons.org. The team would agree that our favorite part of the Top Button's Project is being able to Give Back. In addition to providing cute and modest clothing styles online for young ladies to get ideas from, we take young women on shopping sprees who would not otherwise be able to do so for themselves! As our organization continues to grow, we look to offer the Top Buttons Wardrobe Makeover opportunity for young women across the country- and more often. At the bottom of this post are details on how to collaborate with us on this project if interested. As we have done with shopping sprees before, we took Deni into a shop and filled 2 carts full of clothing! Choosing clothes for Deni to try on was a fun-filled, group effort. As the shopping progressed, the “no’s” turned into “maybe’s” and the “maybe’s” turned into “YES!” We did have to convince her to step out of her box a bit to try on a couple items, but once she put them on, the smile of satisfaction on her face told us how pleased she was. We enjoyed sharing ideas on how to wear different pieces in a way that would express her personal style, work with her body type, and keep her essentials covered. After a morning of power shopping, Deni went home with several items to create a new wardrobe with! This sweet young lady came out of the store radiating with positive energy. When asked what her favorite part of the day was, Deni said, “picking out the clothes!” She shared how she felt honored to have been nominated, and we felt honored to have been able to provide her with this experience. Anastasia Malone is seen below on the left, then Kenady (our TB teen team member), Deni (shopping spree winner), and Anastasia Jones (our TB Give Back Director). All shopping sprees are funded through donations given to our non-profit organization. If you are interested in donating funds or services to provide deserving teens with a Top Buttons Wardrobe Makeover, please contact Anastasia Jones-Downing at anastasia@topbuttons.org.